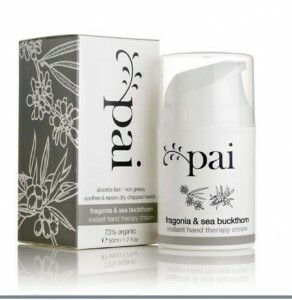 I wanted to let you know about a Pai’s new organic hand cream. It’s from a small company called Pai Skincare who are in the UK, and it contains natural essential oil of fragonia flowers, which smells delicate and beautiful, with calendula and faint citrus notes. The hand cream also contains extract of sea buckthorn, a small hardy shrub that grows wild along the British coastline. As an avid gardener, I’m a hand cream connoisseur. As an OrganicFoodee, I insist on organic skincare products. So you can trust this recommendation. The cream is good!